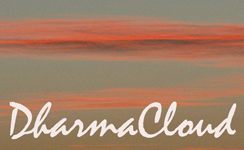 DharmaCloud is an Insight Meditation group which presents and supports Western Buddhist teachings. It runs occasional Insight Meditation courses, practice days and retreats. It has been running Buddhist programs since 1995. An overview of past retreats and workshops is listed here. DharmaCloud also provides a listing of other Insight Meditation groups and retreats in Australia through the www.dharma.org.au website. A related weekly Insight Meditation group, the Heart Insight group, meets on Sunday nights in West End in Brisbane. This reteat has been cancelled. Another retreat is planned for 2020. The DharmaCloud Library is currently at the Bodhi Chan Meditation Centre. It's available on their practice days and at other times by arrangement. DharmaCloud email list: We have an email list for people who would like to receive occasional emails - very occasional - of DharmaCloud events. This is a separate from the list for the Australia-wide quarterly Insight Meditation News. If you'd like to be on the DharmaCloud list, please email us (email address below). DharmaCloud is an unincorporated not-for-profit association, registered with the Australian Charities and Not-for-profits Commission. It is supported by a small group of volunteers. All programs are run on a dana basis. There is a constitution which outlines the operation of the group.